Procedures won't save you (or your passengers) if you don't know and follow them. This year LOBO conducted a review of all Lancair accidents and incidents going back to the first in 1988: a hard landing in a 235. Since then there have been over 550 accidents and incidents involving the Lancair fleet. Our analysis utilized the same methodologies employed by the General Aviation Joint Steering Committee and used the same taxonomy they employed ensuring all parties reviewing the data are on the same music sheet. The subject matter experts from LOBO who studied this data are seasoned Lancair builders, fliers and instructors with thousands of hours in Lancairs. Our review made some interesting discoveries. One of the most interesting is that the number one causal factor was “failure to follow procedures.” I say this is interesting because you would think that the pilot in command would know and follow best practices found in the POH. After all, the regulations require us to know everything necessary for a flight. For example, in more than one case we found pilots who experienced a gear malfunction chose to land with the gear up rather than follow alternate gear extension procedures. Ouch! This isn't a problem in just the Lancair community. The NTSB determined the deadly crash of a Gulfstream G-IV at Bedford, MA in May 2014 occurred after the crew failed to accomplish a pre-takeoff flight control check, a failure encouraged by long-standing, habitual non-compliance with basic preflight procedures. This finding prompted the National Business Aviation Association to conduct an industry-wide survey, which found that habitual non-compliance with procedure is widespread among business aviation flight departments. Senior Avionics and Safety Editor for Aviation Week and Space Technology John Croft says checklists and procedures add layers of safety to aircraft operation. But, he says, those layers have flaws, like the holes in Swiss cheese. And when everything stacks up wrong the holes can align, allowing an error to fall through and develop into an incident or accident. 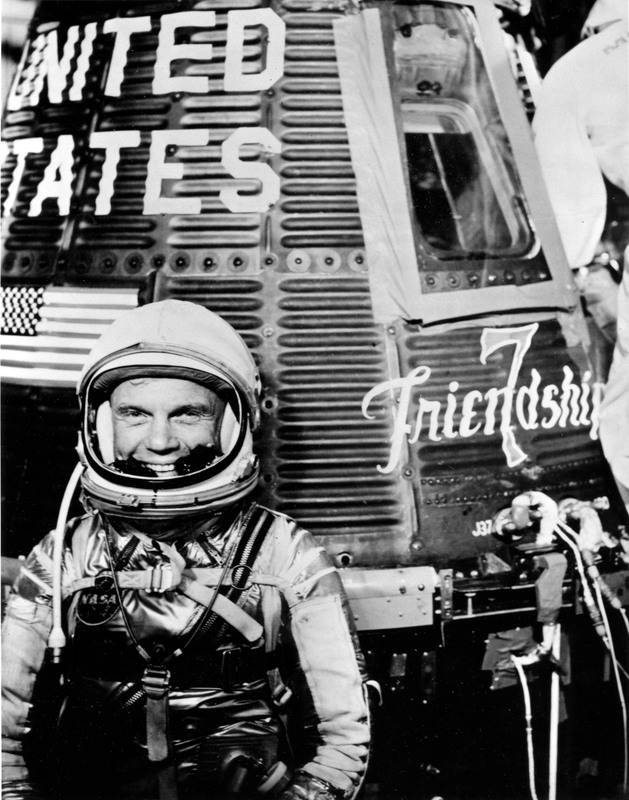 On February 20, 1962 NASA astronaut Lt. Col. John Glenn orbited the earth three times in the Mercury capsule, Freedom 7. He wrote a flight report that was featured in the April 23, 1962 issue of Aviation Week & Space Technology. His comments are as applicable now as they were then. He said, “Humans always have fear of an unknown situation—that is normal. The important thing is what we do about it. If fear is permitted to become a paralyzing thing that interferes with proper action then it is harmful. The best antidote to fear is to know all we can about a situation.” What Glenn encouraged aviators to do was to know everything about their aircraft, about their environment and about themselves as pilots before they get in the cockpit. Sound familiar? FAR 91.103 requires that each pilot in command, before beginning a flight, become familiar with all available information concerning that flight. Most of the military aviators in our group recall that during training they had to memorize emergency procedures and identify every cockpit switch and control blindfolded. Once qualified, they had to pass routine monthly, quarterly and annual written, verbal and practical tests on the aircraft they flew. They were told—and data collected from accident investigation confirmed—that without acquiring and maintaining such knowledge they would be a danger to themselves and others. The danger is no different for GA pilots. What is different is that if we don't acquire and maintain critical knowledge we often share the danger with passengers who are precious to us: our spouses, children and grandchildren. 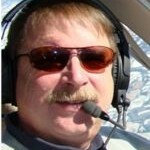 If our most recent study of Lancair accidents tells us anything, it demonstrates that GA pilots—and especially Lancair pilots—need to reexamine our understanding of our aircraft, the environment we fly in and ourselves, with an eye toward raising the bar and furthering our knowledge in all these areas. Do not be content to just kick the tires and light the fires and have a good day of flying. Accept the idea that at any time the engine could quit, the landing gear could remain in the well or the weather could worsen. What are you going to do in that event? I urge you to follow Col. Glenn’s example (and FAR requirements) and know everything necessary to complete the mission safely. Study the POH, review FAA literature, attend FAAST safety seminars and LOBO Landings for more training specific to your operations. Over twenty years ago I wrote an article about emergency landing procedures which was published in the American Bonanza Society Magazine. It referenced the Bonanza training guide and T-34B NATOPS Manual for technical details. The article showed how it's possible to experience an engine failure and glide to a successful landing on a runway or other suitable site within your glide range distance. The Lancair fleet of aircraft have excellent glide characteristics (for example: the IVP has a glide ratio of nearly 20:1 and the Evolution 18:1) IF THE AIRCRAFT IS FLOWN PROPERLY! Remain calm! It does no good to cry like a baby or get old-timer’s syndrome at this moment. At the end of this event your passengers will either believe you were Chuck Yeager with nerves of steel or Bozo the Clown. PERFORM THE IMMEDIATE ACTION CHECKLIST STEPS THAT YOU HAVE COMMITTED TO MEMORY. Maintain control of the aircraft! The aircraft will fly fine without power—it is now a very expensive glider. LOSING CONTROL IS BAD—DO NOT STALL! Maintain altitude if you are above best glide speed (110 KIAS in the Evo or 120 KIAS in the IVP) until you reach best glide speed—then maintain best glide speed. This is precious energy do not give it away! Reduce drag—gear up, flaps up, feather the propeller if possible. If you cannot feather the prop pull the control all the way aft to high pitch (low RPM) position. Keep the gear and flaps up and prop feathered/set to full high pitch until you are ready to land. Turn to nearest airport or other suitable landing site. Assuming you’ve maintained a modicum of situational awareness and know where the hell you are, you should already know where that is. If not, press the NRST button on your GPS. Do not accept ATC vectors away from your chosen landing; the controller is not going to be with you at the landing site. Attempt a restart if you have time and believe the engine might be capable of running. If not secure all fuel sources. Turn off all electrical sources—to eliminate any source of sparks—after putting the gear and flaps down in the pattern. Fly to and arrive overhead the airport, then spiral down in a medium banked turn. 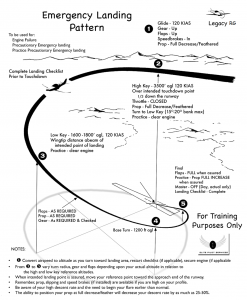 Plan to arrive at high and low key positions at the correct airspeed as you were taught. Many engine out approaches end with a stall close to the chosen landing site because the pilot either ran out of energy before the touchdown zone and tried to extend the glide, got too steep in the turn to final and stalled or overshot the landing zone and stalled off the end. The best way to avoid this phenomenon is to practice—a lot! Land smoothly on the runway. Do not expect your significant other to get back in the airplane any time soon if you screw this up. Except for the engine and propeller comments—the rest is straight out of the glider pilots handbook. Remember: One day you will be a glider pilot. Are you ready? For questions and comments on this post contact Jeff via email: j.edwards [at] lancairowners.com.